You are currently browsing the archive for the Field School category. 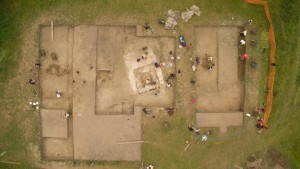 This summer the University of Reading Field School excavated within the landscape between the famous prehistoric monuments of Avebury and Stonehenge in the Vale of Pewsey in Wiltshire. 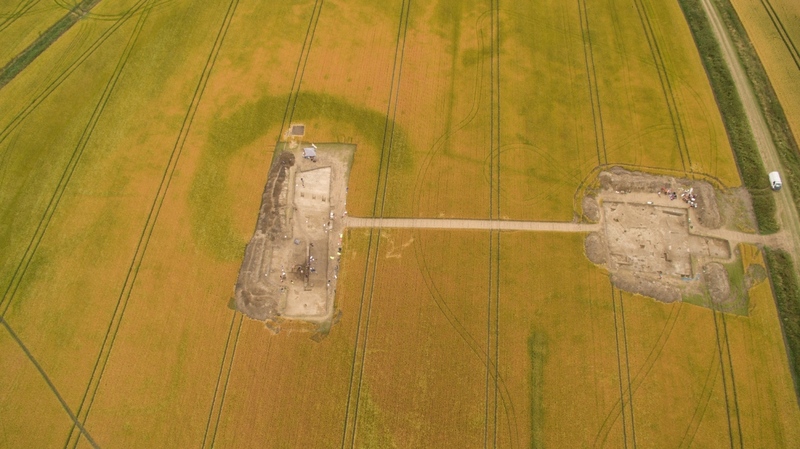 Our excavations focused on two prehistoric henge monuments (Marden and Wilsford) and, with Historic England, a Roman settlement. We also surveyed part of medieval Marden village. Marden henge is a truly huge monument, enclosing an area of 15.7 hectares, making it the largest Neolithic henge in Britain. Our excavations focused to the south end of the monument and we uncovered an extraordinarily well-preserved Neolithic building surface. The complete surface was rectangular with a central sunken area, which was dominated by a large hearth. On the floor were flint flakes still lying untouched in the same position they had been left in, and this is one of the best preserved Neolithic buildings in England. Close to the building were spreads of Neolithic rubbish, which incorporated elegant bone needles, as well as flint flakes and decorated ‘Grooved Ware’ pottery. 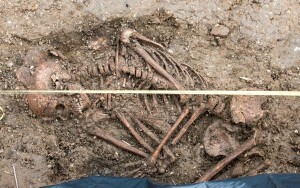 In one area was an assemblage of bones from numerous pigs, clearly representing the remains of a feast. Analysis of the building is ongoing and we do not yet know what it was used for, although we have suggested that it may have been a sweat lodge type building. We also excavated the Wilsford henge on the other side of the river. This is a much smaller monument and completely flattened by ploughing over the centuries. We excavated through the end of the ditch, next to the entrance of the henge, and discovered that the ditch was amazingly deep – over three metres! 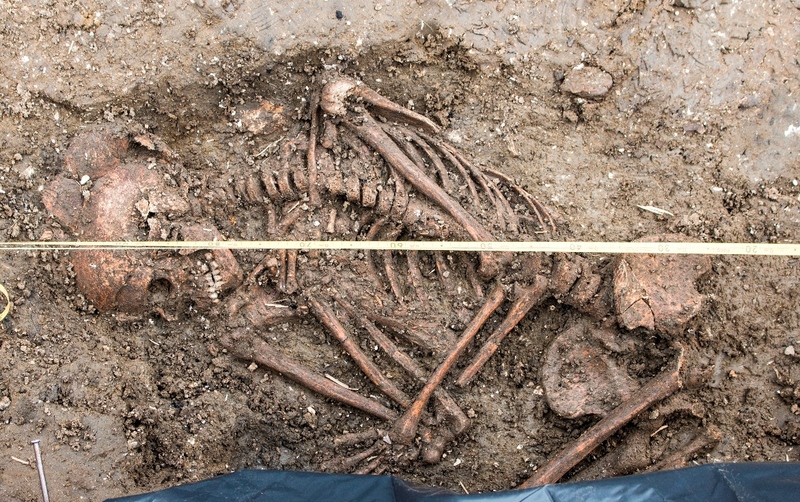 Near the bottom was a very well preserved early Bronze Age burial of a teenager wearing an amber spacer necklace. The striking feature about these monuments is their relationship with the River Avon, which runs between them. Both monuments face the river, as if access or good views of this part of the river were important, and Marden henge in particular sits within a large sweeping meander of the river. The relationship between these monuments and water was evidently a close one and likely to be key to understanding them. To this end and in order to better understand the hydrology of the river in the past, we undertook a geoarchaeological project along the river valley. This work has produced some very exciting results, including thick layers of peat, and will no doubt add significantly to our knowledge. Under the guidance of staff from Historic England we also undertook a detailed topographic survey of an earthwork site located within Marden village. The grass-covered site comprises a series of enclosures of varying size, within which a number of building platforms and a network of tracks or hollow-ways have been identified. The enclosures clearly represent multiple phases of activity, with some of the enclosure banks overlying or reusing earlier features. At the eastern end of the site, two small terraced building platforms were recorded associated with a number of small compounds; these earthworks probably represent the remains of a small deserted medieval farmstead. This site is clearly complex and multifaceted, and interpretation work is ongoing. 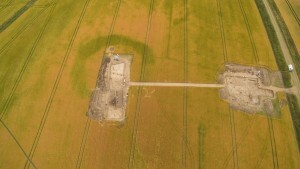 The area around Marden henge has seen very little archaeological work, particularly compared to the famous sites of Avebury and Stonehenge to the north and south. However, we now know that there are many other monuments preserved in the Vale of Pewsey, particularly along the upper reaches of the River Avon. These monuments will all be investigated over the coming seasons. There is clearly much more work to be done in the Vale of Pewsey and as we work through the post-excavation over the winter, we look forward to going back next summer. Visit the Field School website, or follow us on Facebook and Twitter.